Dussehra (tenth day) is one of the significant Hindu festivals, celebrated with much joie de vivre in the entire country. The occasion marks the triumph of Lord Rama over the demon king, Ravana, the victory of good over evil. Brilliantly decorated tableaux and processions depicting various facets of Rama's life are taken out. On the tenth day, the Vijayadasmi day, colossal effigies of Ravana, his brother Kumbhkarna and son Meghnath are placed in vast open spaces. Rama, accompanied by his consort Sita and his brother Lakshmana, arrive and shoot arrows of fire at these effigies, which are stuffed with explosive material. The result is a deafening blast, enhanced by the shouts of merriment and triumph from the spectators. It is significant that the Lord invoked the blessings of the divine mother, Goddess Durga, before actually going out to battle. 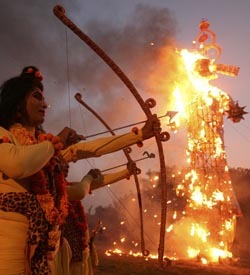 In burning the effigies the people are asked to burn the evil within them, and thus follow the path of virtue and goodness, bearing in mind the instance of Ravana, who despite all his might and majesty was destroyed for his evil ways. It must be remembered that Ravana was a great scholar and an ardent devotee of Lord Shiva, but the very powers that were bestowed on him for his steadfast devotion proved to be his undoing, due to his gross misuse of the same. The festival is also celebrated with intense fervour and zest, in West Bengal and Bengalis nationwide, in the form of Durga Puja. The festivities commence on the first night in the month of Ashwin (September-October). The vibrant festivities last for ten days, of which nine nights are spent in worship, 'Navaratri'. The tenth day is devoted to the worship of goddess Durga, who occupies a special position in the Hindu pantheon of gods and goddesses. She is 'Shakti', the cosmic energy which animates all beings. Beautiful idols of the Mother Goddess are worshipped in elaborate pandals for nine days, and on the ninth day, these are carried out in procession for immersion (visarjan) in a river or pond. According to a Puranic legend attached to this day, the mighty demon Mahisasur, vanquished the gods and their king, Indra, who subsequently fled, leaving behind their kingdoms. They then approached the Holy Trinity, Brahma, Vishnu and Shiva, who decided to destroy the megalomaniac demon, and thus prayed to the divine mother Durga to do the needful. Equipped with lethal weapons, riding a ferocious lion, the Goddess in all her awesome majesty, vanquished the evil one without much ado. This day, thus, also celebrates the magnificence and omnipotence of Goddess Durga. In Tamil Nadu, the first three days are dedicated to the worship of Lakshmi, Goddess of wealth and prosperity, the next three days to Saraswati, Goddess of learning and arts and the last three days to Shakti (Durga). In Tamil Nadu, Andhra Pradesh and Karnataka, families arrange dolls(Bommai Kolu) on artificially constructed steps and prepare an elaborate spread of lamps and flowers. Women traditionally exchange gifts of coconuts, clothes and sweets. Scenes culled from various stories in the epics and puranas are displayed. Traditionally women and children, and now men too visit their friends and acquaintances during these 10 days. They sing songs, tell stories that the dolls might depict and eat a dish made out of chickpeas (choondal). The whole set up is put up on the very first day of Navaratri. After the Saraswati pooja on the ninth day, the whole set up is taken down on Vijayadashmi. Vijayadashami is an auspicious occasion for children to commence their education in classical dance and music, and to pay homage to their teachers. In Punjab, Navaratri is taken as a period of fasting. In Gujarat, the evenings and nights are occasions for the fascinating Garba dance. The women dance around an earthen lamp while singing devotional songs accompanied by rhythmic clapping of hands. 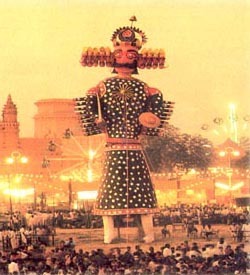 In northern India, the festival wears the colourful garb of Ramlila wherein various incidents from Rama's life are enacted, as is the destruction of Ravana and Bharat Milap, that is the reunion of Ram and his estranged brother Bharat, on the former's return to Ayodhya after 14 years of exile. In the Kulu valley in Himachal Pradesh, the hill- folk celebrate Dussehra with a grand mass ceremony wherein village deities are taken out in elaborate processions. The Dussehra of Mysore, is also quite famous where caparisoned elephants lead a colourful procession through the gaily dressed streets of the city. Like other festivals in the country, Dussehra / Durga Puja is an occasion for festivities on a grand scale, which emanate a genuine feeling of bonhomie and warmth.